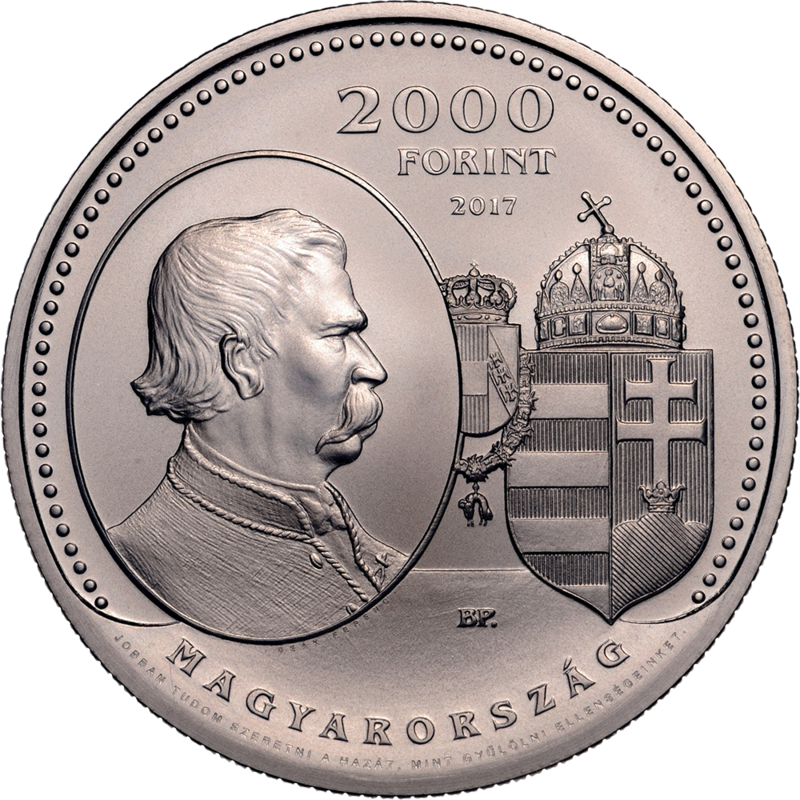 The National Bank of Hungary have launched (24th May) a new double-crown-sized silver coin which remembers one of the country’s most pivotal chapters in modern Hungarian history on the occasion of the 150th anniversary of this national event. From the 1st March 1867, the traditional Austrian Empire, which had existed since 1804, was transformed into a constitutional dual monarchy, officially as “The Kingdoms and Lands Represented in the Imperial Council and the Kingdom of Hungary or, the Lands of the Crown of Saint Stephen”—the empire-kingdom of Austria-Hungary. The change in Hungary’s status within the Austrian Empire, which granted it an equal ranking within the realm, is remembered as “the Compromise.” It is essentially the beginning of an independent Hungarian nation, first within what would be referred to as the Austro-Hungarian Empire from 1867, then as the separate Kingdom of Hungary from 1920, and ultimately as a republic in the years following the Second World War. The coin was designed by István Kósa and produced by the Mint of Hungary with facilities in Budapest. The obverse bears a portrait of Ferenc Deák, inspired by the work of Ede Telcs (see featured image at the top of the page), with a partially covered Habsburg coat of arms linking to the coat of arms of the Kingdom of Hungary. 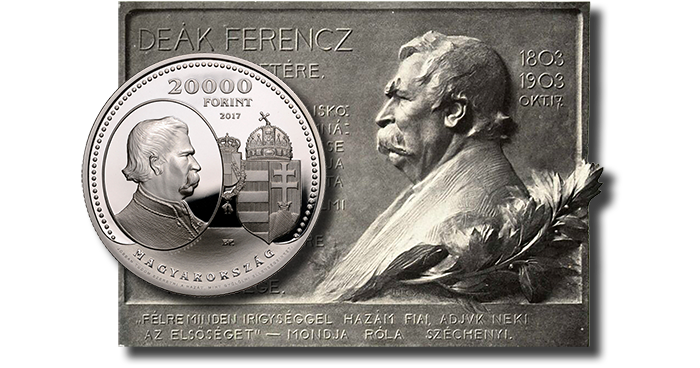 Seen in small letters, Ferenc Deák’s name is located below the lower border of the portrait; around the bottom of the coin is a famous quote by Deák: JOBBAN TUDOM SZERETNI A HAZÁT, MINT GYULÖLNI ELLENSÉGEINKET (“I am more able to love my homeland, than to hate my enemies”). The reverse bears portraits of Empress Queen Elisabeth and Emperor King Franz Joseph I, with the portraits partially covering the Austrian coat of arms to the coat of arms of the house of Habsburg at the left. The names of the pair are found below the portrait, with the script KIEGYEZÉS (“Compromise”) at the bottom of the field. On the upper half of the reverse, a sun-like ornament contains the year of the Compromise and the year of minting one above the other, with the dates sharing the final digit to denote the occasion of this collector coin. 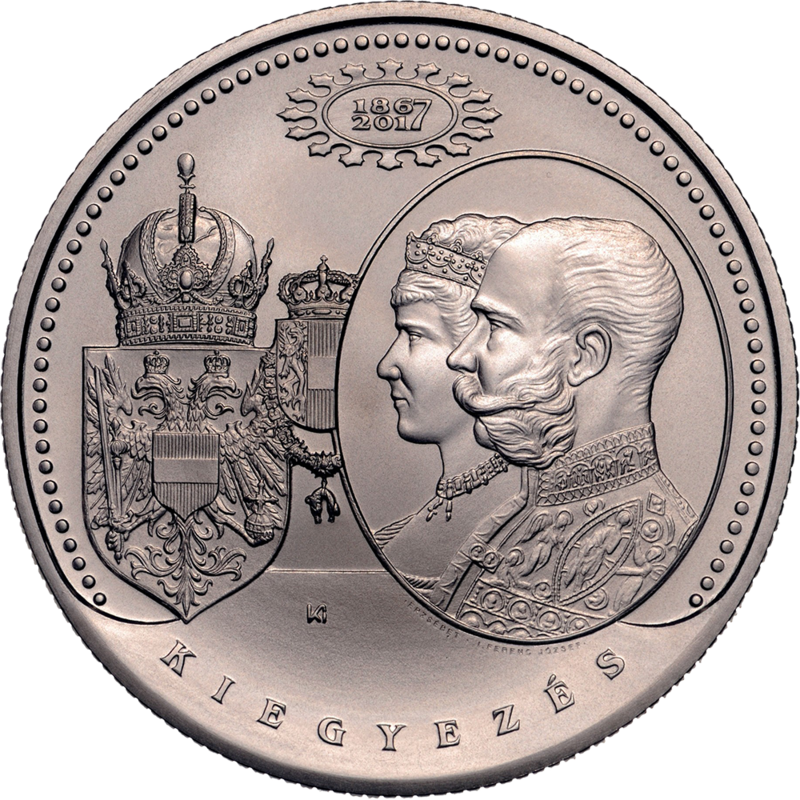 The double crown is issued as a 20,000-forint silver Proof strike and a 2,000-forint, base-metal Brilliant Uncirculated collector coin; the designs, diameter, and mintage limits are identical. Please visit the e-webshop of the Mint of Hungary for additional information on these coins. The “Compromise of 1867” is the common term used for the agreements which re-established the political, legal, and economic relations between the Austrian Empire and the Kingdom of Hungary at the beginning of 1867, thus forming a dual monarchy between the two states. It was negotiated between the head of the house of Habsburg, Emperor Franz Joseph I (1830–1916), and the delegation headed by Ferenc Deák (1803–1876), Hungarian statesman and minister of justice; and Gyula Andrássy (1823–1890), who would become the first prime minister of Hungary. The compromise followed from the crucial events in the spring of 1848. The revolution that succeeded in Austria and Hungary resulted in the abolition of feudal relations within the Habsburg Empire and a shift toward a growing middle-class society. However, after the Hungarian Revolution was suppressed in 1849 under martial law (which was unexpectedly implemented against agreements previously put into place), the Austrians attempted to move forward with modernisation while exploiting the results in their efforts for ascendency in leading a unified German nation. The Austrians overestimated their might—by that time they no longer fulfilled the conditions for being a great power and instead were only capable of being a regional power. Despite being the second-largest country in Europe (after the Russian Empire) and the third most populous, with the fourth-largest industrial economy at the time of the compromise, the Habsburg Empire was vulnerable because it had rigidly resisted the calls for self-government of the national minorities living within its territories for more than half a century. After its weakness was exposed by severe military defeats in 1859 and 1866, the emperor and his advisors realised that restoring the peace in Hungary was a key prerequisite for the continued existence of what was to become the Austro-Hungarian Empire. 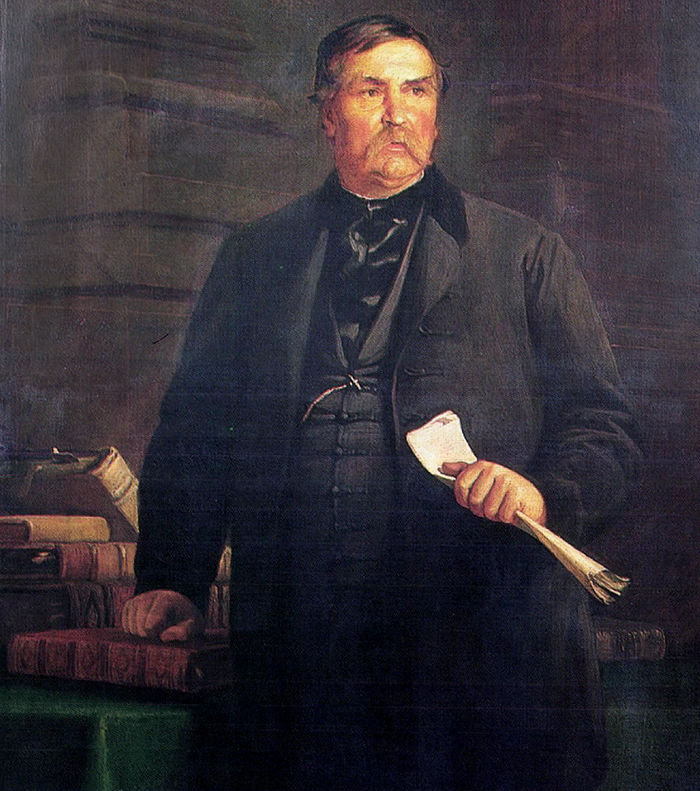 The negotiations led to the adoption of Law-Article XII of 1867, which stated that the person of the sovereign and the Sanctio Pragmatica would be the core pillars which united the two sovereign nations. Based on the latter—specifically, the hereditary lands of the Habsburg provinces—the so-called “common matters” arose, such as foreign and military policy and the related financial aspects. The budget for the three joint ministers acting in these fields was to be negotiated by delegations from both parts of the empire, resulting in Hungary’s agreeing to assume part of Austria’s national debt. It would furthermore conclude a compromise with Austria which would be renewed every 10 years and would unite the monetary systems of the two states. Furthermore, the Hungarian government concluded a separate compromise agreement with Croatia, thus creating the Kingdom of Croatia-Slavonia (1868–1918), which entered into effect on the 26th September 1868. The ceremonial high point of the compromise occurred on the 8th June 1867, when Franz Joseph I was re-affirmed as Hungary’s sovereign and was crowned as king of Hungary in a lavish coronation ceremony at the Matthias Church in Buda. According to the prevailing opinion at the time, Empress Queen Elisabeth (1837–1898) played a key role in the compromise, and she is fondly remembered to this day in Hungary for exerting her influence in favour of the Hungarian people’s interests. I am more able to love my homeland, than to hate my enemies. The dual monarchy of Austria-Hungary adopted a flag depicting the two nations side by side, along with a monetary system (the krone/koruna) that depicted both national insignias and lasted from its adoption in 1867 until the conclusion of the First World War in 1918. As a defeated geo-political entity allied with the Axis powers of Germany and Turkey, the thousand-year-old Austrian or Hapsburg Empire was at an end and was succeeded by the Republic of Austria, with Hungary retaining the monarchy and becoming an independent kingdom—although without an actual king on the throne. The heir to the Austrian Empire and the kingdom, Emperor Karl I of Austria, succeeded his great-uncle, Francis Joseph I, on the 21st November 1916, and as Karel IV of Hungary (1887–1922) would be remembered as the last Hapsburg sovereign. Although he “renounced participation” in state affairs on the 11th November 1918, the emperor did not officially abdicate but was effectively removed from power in Vienna. He was represented by a regent in Budapest in the person of Admiral Miklos Horthy (1868–1957) from the time of the official formation of the kingdom on the 29th February 1920 until his removal from the position by the occupying Third Reich on the 15th October 1944. Attempts by Charles IV to return to the throne before his untimely death in 1922 were prevented by threats of war from neighbouring countries and by the lack of support from Horthy, who had been elevated to the status of a “serene highness” in court circles upon his assumption of the Hungarian regency. From the 1st February 1946 until the 20th August 1949, Hungary was a constitutional and parliamentary republic but with strong communist influences and political power supported by the Soviet Union. The constitution passed by its parliament which was essentially a copy of the constitution of the USSR. Hungary was declared a people’s republic allied with Moscow—and subsequently with the Warsaw Pact of Nations. This government remained in place until an historic parliamentary session on the 16th October 1989, when a declaration and legislation supported multi-party parliamentary elections and a direct presidential election. Hungary’s first free parliamentary election, held in May 1990, was effectively a plebiscite on communism, which was soundly defeated—enabling Hungary to declare itself a constitutional republic on the 23rd October 1989.